Add 1 tsp. of solution per gallon of water. If the water source is believed to be extremely contaminated by known or unknown toxic substances, proper laboratory analysis will be required in order to give accurate dilution rates. Simply fill the upper chamber of your water system with water and add 1-2 tsp. 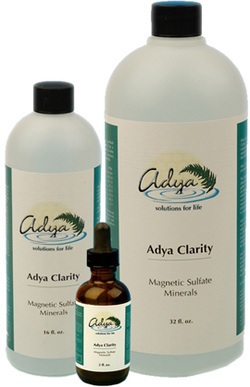 of Adya Water Purifying Solution. The upper chamber of the filtration system holds approximately 1-1/2 gallons (5L) of water. After adding Adya Water Purifying Solution to water you may drink it immediately, however, you may notice that the water has become cloudy or murky looking. This is caused by the flocculation process and is perfectly normal. The water is safe to drink, but may look unpleasant. Depending upon the quality of your water, you may wait 24-48 hours for precipitates to settle to the bottom of your water container. Simply pour off the clean portion of the water into another container for drinking use and discard the remaining portion.